In order to spend true alone time with God and study His word, I would have to wake up super early or go to bed very late. Waking up early wouldn’t be such a bad idea if I weren’t exhausted from the night before. And staying up after everyone goes to sleep isn’t such a bad idea either, but then I’d literally run the risk of dropping my Bible on the floor after losing control of my limbs while drifting off to sleep. MY reality is that I have to get it in WHENEVER I can. Today it was during nap-time. 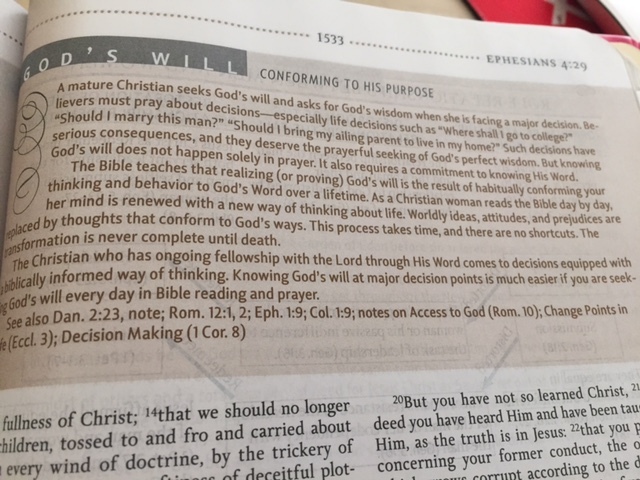 I decided to start reading in Ephesians and ended up in chapter 4. I encourage you to read that chapter and any other verse/chapter that I reference from here on out for yourself! 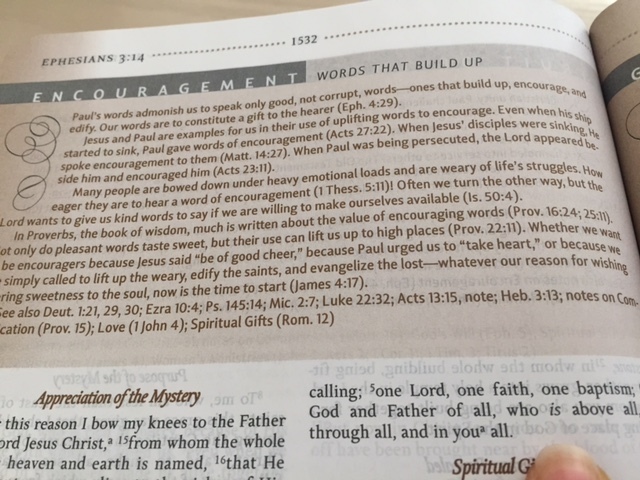 In my Bible, I have topical notes at the top of the pages that go a little deeper into the word and most times give a very practical explanation. Remember I’m fresh at all of this, even being a Christian, so those passages come in handy. READ them below… (you can click the picture & press control + or command + on a MAC to zoom in) so no excuses! I started reading this one first which explains how powerful words can be. This is especially important to me regarding my husband and children. I always intend on choosing the best words to get my point across but oftentimes fall short, especially with my husband. Marinate on that and bear it in mind each time you choose to make your voice heard. But thats not what I mean here. Instead, offer your opinion but let it be encouraging to the next person and well thought out. Think WWJD (What Would Jesus Do), just replace ‘do’ with say in this case, WWJS if you will.